Pyramid Tiered Cake Stand for displaying elegant cakes and preparations at weddings, parties and buffets. 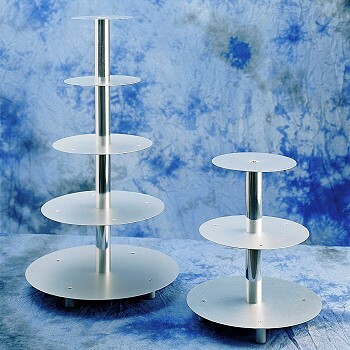 Professional grade cake stand includes seven tiered cake plates. The cake stand can be assembled with as few as 1 cake plate to as many as 7 cake plates. So you create the look you desire ! Overall height 56" when fully assembled. Distance between cake plates 13". Steady and durable stand made of special strong aluminum. Assembly required.